Jaguar’s F-Type is already available in a number of variants but the expansion of the sports car range is far from complete. The strategy mimics that used by Porsche for its 911, which caters to a wide variety of buyers, and it’s one Mercedes-AMG plans to implement for its new GT sports car. 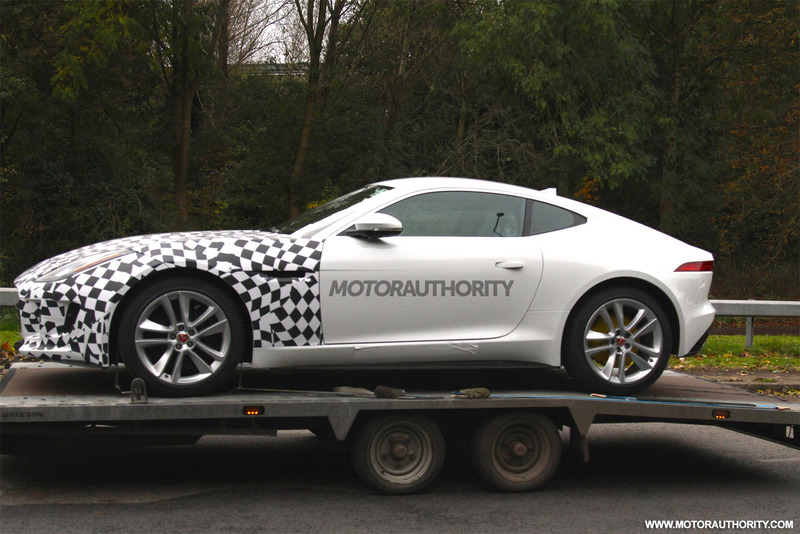 So what other F-Type variants can we expect from Jaguar in the near future? We know the F-Type will eventually get the SVR treatment as well as an entry-level four-cylinder model. But before these arrive, the stunning sports car is likely to arrive in all-wheel-drive flavor. 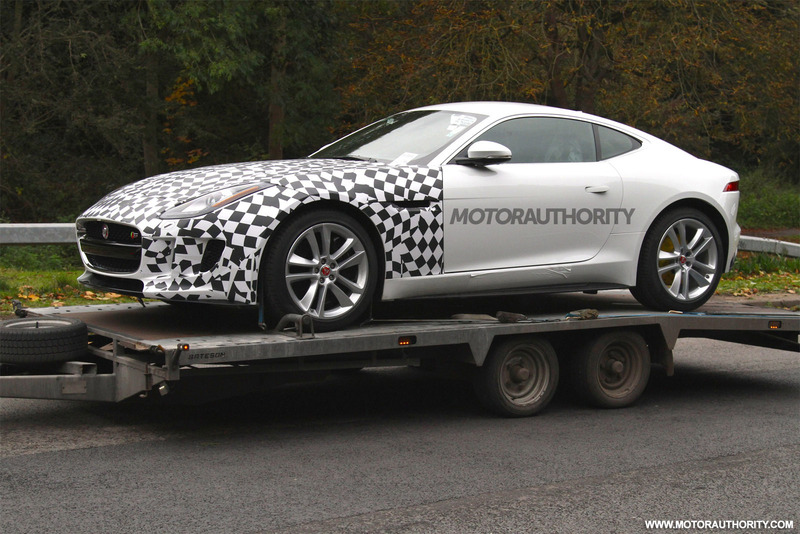 All-wheel-drive F-Types have already been spotted in the U.K. sporting “AWD” badges on their trunklids, and according to CAR we’ll see the new variant formally introduced at next month’s 2014 Los Angeles Auto Show. Adding all-wheel drive to the F-Type is a natural move for Jaguar as it provides the British automaker with a direct rival for the all-paw 911. All-wheel drive is also a popular option with buyers located in the northern states of the U.S., so the move should help boost sales. Other upgrades planned for the F-Type include a long-overdue manual option. A new F-Type R convertible is also just around the corner. Stay tuned for an update in the lead up to the 2014 Los Angeles Auto Show, press days for which run November 18-20. From the moment it was unveiled, the Jaguar F-TYPE gained global recognition as a great contemporary British design - including the prestigious World Car Design of the Year accolade - and now its appeal has been further enhanced by the creation of the exclusive British Design Edition.
" The F-TYPE is a sports car that excites the senses, with a visual drama that is both individual and very British. Creating the British Design Edition gave us the opportunity to subtly enhance the way the F-TYPE looks - inside and out." Based on the F-TYPE S Coupé and Convertible, and featuring a range of visual enhancements and additional equipment, the British Design Edition is offered in a specially-selected colour palette inspired by the Union Jack: Caldera Red, Glacier White and - new to the F-TYPE range - Ultra Blue. Ultimate Black is also available. Further enhancements to the F-TYPE's award-winning design come from the Sport Design pack and discreet British Design Edition badges front and rear, with unique branding on the centre console, headrests and the stainless steel tread plates. Complementing the range of exterior colours is a crafted premium Jet leather interior finished with contrast stitching in a choice of three colours. The driver-focused theme of the 'one-plus-one' cabin is heightened by carbon fibre trim around the centre console. Jaguar's InControl Touch and InControl Touch Plus infotainment systems are offered with upgraded audio equipment developed together with leading British experts Meridian. InControl Touch and InControl Touch Plus support a range of apps which make it easier than ever for the driver to stay connected. Befitting its status, the F-TYPE British Design Edition model is offered in Caldera Red, Glacier White and - new to the F-TYPE range - Ultra Blue. Customers also have the choice of Ultimate Black. Enhancing the F-TYPE's dramatic lines is the Sport Design Pack. Optional on the S model, this is standard equipment on the British Design Edition and comprises a gloss black front splitter, body-coloured side sill extensions and rear venturi - a fixed rear spoiler is also available for the Coupé. The F-TYPE's interior has always been a special place to be. The combination of a driver-orientated 'one-plus-one' cockpit, superbly comfortable and supportive seats, and luxury materials and finishes make Jaguar's sports car different. Replacing the aluminium of the F-TYPE S, carbon fibre trim is used on the centre console - this is also complete with British Design Edition branding. The texture and satin finish of this material complements the premium Jet leather interior perfectly. The standard specification of the British Design Edition also includes upgraded audio compared to the F-TYPE S. Vehicles equipped with the InControl Touch infotainment system benefit from a 380W Meridian system with 10 speakers, while the InControl Touch Plus system delivers 770W of Meridian surround sound through 12 speakers. Both InControl Touch and InControl Touch Plus support the familiar InControl Apps and InControl Remote features, but the InControl Remote App is now available for the Apple Watch. Interacting with the vehicle - from anywhere in the world - has never been easier. Functionality is similar to the current InControl Remote smartphone app, so drivers will be able to use their Apple Watch to lock and unlock the vehicle, check how much fuel is in the tank and find it on a map. It's even possible to set the climate control and start the engine to bring the cabin to the desired temperature before the journey begins. The only thing about the F-Type is the terrible infotainment which should be fixed by the 2017 model year. The new Jaguar F-TYPE SVR is the first Jaguar SVR, developed to exploit the lightweight aluminium sports car's full potential while retaining its inherent tractability and day-to-day usability. The Jaguar F-TYPE SVR is a 200mph, all-weather supercar. More powerful, lighter, and benefiting from an enhanced chassis and driveline and active aerodynamics, the all-wheel drive F-TYPE SVR Coupé and Convertible deliver supercar performance - in all conditions - and unrivalled driver engagement and reward. "The purity of the F-TYPE's form is something truly special, but in designing the new F-TYPE SVR we had the opportunity to create something even more dramatic. Every additional form, line or component is there for a reason, and contributes to the car's increased performance as well as its presence. "Cutting-edge aerodynamics have always been fundamental to Jaguar design, and everything from the enlarged air intakes to the active rear wing is essential to the new F-TYPE SVR's dramatic looks and 200mph potential." Raising the output of Jaguar's supercharged 5.0-litre V8 to 575PS and 700Nm enables the F-TYPE SVR to accelerate from 0-60mph in just 3.5 seconds. Maximum speed of the Coupé model is 200mph, the Convertible 195mph. By exploiting the fundamental capability engineered in to the F-TYPE from day one, Jaguar Land Rover's Special Vehicle Operations division has developed Jaguar's fastest and most powerful series production road car. "Our objective was to take everything that our customers love about F-TYPE - the performance, the handling, the sound, the design - and take it to a whole new level. This is what the new F-TYPE SVR delivers: it's a 200mph all-weather supercar. "With 575PS, less weight, an uprated chassis and bespoke calibrations for the transmission and all-wheel drive system, performance is even more accessible and exploitable. This is a car that SVO has developed for true enthusiasts but it's one that can be enjoyed every day." The F-TYPE SVR features the latest evolution of Jaguar's 5.0-litre supercharged V8 to deliver the ultimate in performance and driver reward. Changes to the engine's calibration - adopted from the F-TYPE Project 7 - deliver power and torque ratings of 575PS and 700Nm. The new lightweight titanium and Inconel exhaust system can withstand higher peak temperatures, reduces backpressure and saves 16kg - a weight reduction which exceeds the demanding target set during development. Compared to the F-TYPE R's stainless steel system, Inconel's increased thermal resistance meant that wall thickness could be halved to just 0.6mm. The new system also delivers an even more distinctive, purposeful, harder-edged exhaust note, especially once the active valves in the rear silencers open - this happens at lower engine speeds to enhance the F-TYPE SVR's performance character still further. Even the valves themselves are made from titanium because this is the ultimate lightweight solution. The four round tailpipes are distinguished by discreet SVR branding. To make the most of the increased engine output, the eight-speed Quickshift transmission gains a new calibration. Together with the extra grip delivered by the wider, 265- and 305-section front and rear tyres (10mm wider than the F-TYPE R), and optimising the torque on-demand all-wheel drive system's Intelligent Driveline Dynamics (IDD) control technology, this delivers the F-TYPE SVR's outstanding launch behaviour and immediacy of response. The changes to IDD and refinements to the rear electronic active differential (EAD) ensure optimum torque distribution between the front and rear axles and across the rear axle. Combined with a unique calibration for the Dynamic Stability Control (DSC) system, this enhances traction and dynamics - on all surfaces and in all weathers - while preserving the F-TYPE SVR's rear-wheel drive character and handling balance. Selecting Dynamic mode will enable the enthusiast driver to fully explore the F-TYPE SVR's capability, especially with the DSC system set to TracDSC or switched off completely. Under these conditions, IDD will use the most extreme calibrations for the AWD system and for the EAD to fully exploit the available grip. The gains in performance and driveability do not come at the expense of fuel consumption and CO2 emissions: compared to the F-TYPE R, the figures on the European combined cycle remain unchanged at 25mpg and 269g/km respectively. The enhancements made to the powertrain and driveline are matched by the modifications made to the chassis. Designed to take the SVR's dynamic capability to the next level, and deliver ultimate chassis agility, precision, control and response, the changes nevertheless preserve the F-TYPE's ride quality and inherent duality of character - day-to-day usability and comfort have not been compromised. The F-TYPE's aluminium double wishbone front and rear suspension and state-of-the-art electric power-assisted steering (EPAS) system gave the SVO team the best possible starting point for developing the SVR's vehicle dynamics. That the vehicle is 25kg lighter as standard than the AWD F-TYPE R - and 50kg lighter with options including the Carbon Ceramic Matrix brake system and carbon fibre roof - brings immediate benefits in terms of handling. Optimised aerodynamics produce further gains: the rear wing delivers reductions in lift whether in the raised or lowered position. These fundamental improvements are matched by a raft of other hardware and software changes designed to extract the full potential from every part of the chassis. The rear anti-roll bar is thicker. The valves inside the continuously-variable dampers have been revised and the control software - the heart of Jaguar's Adaptive Dynamics system - has been recalibrated. The overall effect is that both low speed comfort and high speed control are improved. The rear knuckle is completely new. Now an intricate, weight-optimised aluminium die casting, the design of the part enables a 37 per cent increase in camber stiffness and a 41 per cent increase in toe stiffness, which translates into greater control of the tyre contact patch and an even more connected steering feel. The front anti-roll bar diameter has been reduced slightly. Together with the revised damper control software, a unique tune for the Torque Vectoring system which enables even more precise control of the braking applied to the inner wheels, the changes mitigate understeer - even at high corner entry speeds. Fitted as standard with Jaguar's Super Performance braking system featuring large, 380mm and 376mm front and rear brake discs, the F-TYPE SVR can be specified with Jaguar's Carbon Ceramic Matrix (CCM) braking system. Featuring even larger 398mm and 380mm discs and six- and four-piston monobloc calipers, this system delivers exceptional braking performance with outstanding fade resistance. The brake prefill system ensures consistent pedal feel, stop after stop. The wider, specially-developed 265/35/ZR20 and 305/30/ZR20 tyres provide exceptional levels of grip with no detriment to ride quality or refinement. The range of 9J and 11J forged aluminium wheels deliver savings of up to 13.8kg per vehicle - another weight reduction which beat the development target - and the open spoke design also improves brake cooling. Exclusive to the F-TYPE SVR, the range comprises Coriolis wheels in Satin Technical Grey or Gloss Black, and - for models fitted with the CCM braking system - Maelstrom wheels with a Satin Black polished finish. The F-TYPE's EPAS system already sets the benchmark for feel and response - especially off-centre. Further tuning of the control software delivers even better feedback and, combined with the stiffer rear knuckle assembly, the new wheels and tyres and the revised damper settings, means that the F-TYPE SVR steers with even greater immediacy and precision. The effort made in developing the chassis was matched by the work done on the F-TYPE SVR's aerodynamics. Asked to solve the often conflicting requirements of reducing drag and reducing lift, the SVO team designed a full suite of features which work together to improve dynamics, stability, performance and efficiency. To cut drag, the front bumper was extended outboard to mask as much of the wheels as possible. This also helps the airflow to remain attached to the sides of the car, reducing drag still further. The front valance and front undertray also contribute to drag reduction but do much more to improve engine cooling. The louvre design of the new bonnet vents uses the flow of air over the bonnet to extract more hot air from the engine compartment. Apertures in the wheelarch liners help the high pressure air to escape through the fender vents, helping to reduce front-end lift. With the car in Normal mode, the wing deploys once vehicle speed reaches 60mph and 70mph for the Convertible and Coupé respectively. The wing will also deploy automatically whenever the driver selects Dynamic mode. In this raised position, the wing, together with the other aerodynamic enhancements, enables a reduction in the F-TYPE SVR's drag and lift coefficients of 2.5 per cent and 15 per cent respectively compared to the F-TYPE R with spoiler deployed. When the SVR's wing is in the lowered position, the corresponding improvements are 7.5 per cent and 45 per cent. Exterior design options to complement the carbon fibre rear wing include a carbon fibre roof panel and a carbon fibre pack comprising the front chin section, bonnet louvres, fender vent ingots and door mirror caps. The F-TYPE SVR's performance does not come at the expense of comfort. The cabin gains cosseting 14-way SVR Performance seats finished in Jet black leather with a distinctive Lozenge Quilt pattern, contrast stitching and micro-piping and headrests embossed with the SVR logo. Customers also have the option of Siena Tan or Red leather. The driver-focused theme of the 'one-plus-one' layout is enhanced with a suedecloth covering for the instrument cluster and centre console. Customers who select the optional Siena Tan or Red leather interiors benefit from full leather wrapping of the instrument panel. The InControl Touch and InControl Touch Plus infotainment systems feature eight-inch capacitive touchscreens, intuitive user interfaces and crisp, clear 3D map displays and offer 380W Meridian and 770W Meridian surround sound audio systems respectively. As well as the familiar InControl Apps smartphone connectivity, InControl Secure vehicle monitoring and InControl Protect emergency call system, the F-TYPE SVR also offers the latest InControl Remote functionality, which - for the ultimate in convenience - now supports wearable technology. I can't imagine that car with 600hp. I heard a guy with a V8S convertible say he was going to sell it because the car just had too much HP for him to handle. New York City's Park Avenue Tunnel was closed off to the public as British car manufacturer Jaguar showcased the distinctive sound of the new F-TYPE SVR ahead of the 2016 New York International Auto Show [NYIAS]. Along with its performance and handling, the F-TYPE's visceral sound is one of the most celebrated features of Jaguar's highly successful sports car. The tunnel, which passes under seven blocks of the iconic Park Avenue area in Manhattan and is 422 metres long, provided a unique environment to experience the distinctive, purposeful, and harder edged sound delivered by the F-TYPE SVR. Key to the new car's phenomenal sound is its Titanium and Inconel exhaust system. This enhances the F-TYPE SVR's high performance character still further. As part of the New York demonstration, Jaguar used a custom technology specially adapted to respond specifically to the exhaust note of the F-TYPE SVR. As the car powered through Park Avenue tunnel, a series of specially installed lights changed colour from white to Jaguar Red in tandem with its increasing acceleration. The F-TYPE SVR also features the latest evolution of Jaguar's 5.0-litre supercharged V8 to deliver increased engine output and the ultimate in performance and driver reward. The F-TYPE SVR is the first Jaguar SVR and the fastest F-TYPE ever with a top speed of 200mph. It has been developed by Jaguar Land Rover Special Vehicle Operations to be lighter, quicker, faster and more powerful while remaining tractable and useable day-to-day. Priced from £110,000 for the Coupe and £115,485 for the Convertible, more details available on Market Selector. Rally cars aren’t known for being… convertible. To hell with tradition, then, because Jaguar has built two special F-Types with a suite of modifications turning them into stage monsters. The two cars get Jag’s 2.0-litre four-cylinder engine, here pumped up to 296bhp, along with upgraded brakes – grooved discs and four-piston calipers front and back – and proper competition suspension. The dampers are hand-built and offer three way adjustability, while the springs are softened up because rallying involves rather a lot of rough surfacing. There are also motorsport-spec wheels thrown in, along with a limited slip diff, the all-important bonnet-mounted light pod, fire extinguisher, FIA-spec roll cage, competition seats and a proper hydraulic handbrake. We’re told the design takes inspiration from Jaguar’s F-Type Chequered Flag limited edition car – itself starting from £62k – though, annoyingly, no price has been offered for the rally cars. Shame. Because they look like a load of fun. Indeed, that old XK completed three consecutive Alpine rallies in the early 1950s. We’re told the pair of Jags ripped up the Walters Arena rally stage in South Wales, and will be doing drifty things at select events over the next few months.